Thanksgiving is all about being thankful – for the people you love, the delicious food, and the happy memories. With Thanksgiving around the corner, it’s important to begin planning the details before the big event. Whether you’re hosting Thanksgiving dinner at your home or heading elsewhere to meet friends or family, it’s imperative to prep for the big day in order to keep your stress levels low and the happiness levels high. 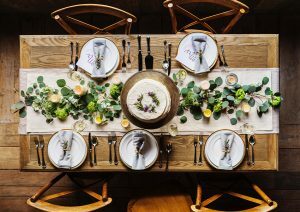 The Degnan Group at Key Realty loves to make your life easier, so we put together our top 10 Thanksgiving prep tips to help you have your best Thanksgiving yet! Compile your favorite Thanksgiving recipes that you plan on serving your guests. Whether it’s that new recipe you recently found online with rave reviews or a classic family recipe, there’s no food that won’t be appreciated at your Thanksgiving table. Make sure to have your recipes handy on cooking day—you don’t want to scramble last minute looking for them while something is burning in the oven! You know what they say — never leave anything last minute, especially around Thanksgiving! Create a to-do list with a timeline, as well as your schedule for the oven as it most likely will be crowded by turkey on the day of! Although we’re one week away from the big day, it’s never too early, or too late, to begin planning. Try handwriting a schedule, or if you’re computer-savvy, make a spreadsheet—trust us, organization is key. Thanksgiving requires copious amounts of delicious foods. Whether you’re hosting four people to a massive party of thirty, freezer and refrigerator space will need to be optimized. Throw out any old or freezer-burned foods to make room for your make-ahead dishes. Have a second refrigerator or freezer in the garage? Use it! Cooking and freezing as many dishes as possible will not only save you time on Turkey Day but will allow you to enjoy time with your guests. Have you ever experienced the Thanksgiving Day rush at the grocery store? It’s scary. Like most people, there’s always something that’s inevitably forgotten and can only be bought at the grocery store. Avoid the rush by planning your shopping trips early in advance—preferably before Monday. Always forget your grocery list at home? Try writing one in the notes section of your smartphone—it’s always available and will never disappear into the trashcan. Prep work is key to the perfect Thanksgiving meal. Since the turkey will hog your oven on the day of, it’s important to do all your baking of pies and side dishes a few days before. Mashed potatoes reheat perfectly on the stove or slow cooker and desserts thaw out in a few hours on the counter. It’s amazing how much easier it is to serve a delicious meal when you only have to reheat a few things! Table decor helps set the mood for your Thanksgiving feast. Whether you prefer an easy cleanup by using paper and plastic or setting out your finest china, table decor is the perfect way to get your guests in the holiday spirit. Try collecting perfectly crisp orange and red leaves from your backyard and spreading them across the table. Or make small mini bouquets of your favorite autumn stems. No matter how casual or fancy your Thanksgiving dinner is, having your table set and ready to go is one more task you’ll be happy you checked off before your guests arrived. It’s can be nice to feel in control when planning your Thanksgiving dinner, but sometimes it can be overwhelming. It’s okay to ask for help from friends and family. Whether each guest brings over a different dish, or you need assistance in stirring the gravy, never be afraid to accept an offering hand. Not only are guests usually willing to help, it’s nice to bond over a meal that was made together. Although we doubt this is anyone’s favorite task, it must be done. Having a clean house is important for every event where guests are invited into your home. If you’re not feeling up to it, splurge and schedule a cleaning service to come early in the week to take care of the task. If you prefer to do it yourself, whip out the vacuum and the duster and get to it. Remember, guests will most likely not go into the bedrooms or upstairs—so keep the focus on the dining room, living room, and guest bathroom. Easier said than done, but stress is not what Thanksgiving is about. 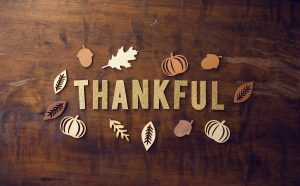 Sometimes we forget that Thanksgiving is not about the food or table decor, but about the friends and family that are in your life. Whether you’re hosting your first Thanksgiving dinner or hosting your twentieth, try not to put too much pressure on yourself. In the end, it’s just dinner. Thanksgiving is the perfect time of year for reflection. It’s a unique day when loved ones come together for a special meal, so take advantage of it! Whether you prefer to share your gratitude out loud or write down on paper what you’re thankful, make sure to set time aside to reflect. As lucky as we are, some are not as fortunate. Create new Thanksgiving traditions and serve dinner at a homeless shelter or deliver Thanksgiving meals to lonely neighbors—that’s what the Thanksgiving spirit is all about. The holiday season the perfect time to start thinking about the future. Thinking about selling your home in Toledo? After the holidays is a great time to start prepping your home for sale. For the most professional and knowledgeable relators in the Toledo area, contact the Degnan Group at Key Realty.